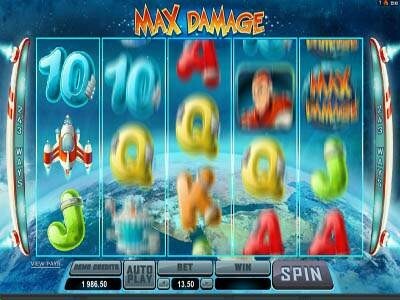 Max Damage is one of the new games that are released by Microgaming. The game has an arcade theme to it, which is apparent from the moment players open the game and notice the arcade themed visuals. Even the bonus game of this slot machine is based on arcade games. Max Damage has 5 reels and offers players a total of 243 ways to win, which means that whenever players spin the reels of the game, they are going to have 243 different chances of winning. Apart from the ways to win, the game has special symbols such as the wild icon that can replace other icons. This wild icon is none other than the wild logo of the game. Other special symbols include the scatter green alien space ship that can give out scatter pays as well trigger up to 15 free spins on the game that come with doubled winnings.